^ a b "Africa Ultra-Prominences" Peaklist.org. Retrieved 2012-02-06. ^ a b c d e f g h i j k l m n o p q r s t u v w x y z aa ab ac ad ae af Bussmann (2006). ^ IUCN SSC East African Plants Red List Authority (2013). ^ a b Maundu & Tengnäs (2005:437). ^ World Conservation Monitoring Centre (1998b). ^ World Conservation Monitoring Centre (1998a). ^ a b Kamau et al. (2016). ^ Maundu & Tengnäs (2005:260). ^ a b c d Coe (1989:265). ^ Magombo et al. (2004). ^ Williams & Crook (2016b). ^ a b c 水野 (2017). ^ Williams & Crook (2016c). ^ a b 湯浅 (2008:20). ^ Williams & Crook (2016e). ^ a b 冨山 (2003:165). ^ Williams & Crook (2016a). ^ a b 冨山 (2003:162). ^ Williams & Crook (2016d). Beentje, H.J. (1994). Kenya Trees, Shrubs and Lianas. Nairobi, Kenya: National Museum of Kenya. ISBN 9966-9861-0-3. http://www.nzdl.org/gsdlmod?e=d-00000-00---off-0unescoen--00-0----0-10-0---0---0direct-10---4-------0-1l--11-en-50---20-about---00-0-1-00-0--4----0-0-11-10-0utfZz-8-00&a=d&c=unescoen&cl=CL1.6&d=HASH01b88f73433d5003648dbf5b. Benson, T.G. (1964). Kikuyu-English dictionary. Oxford: Clarendon Press. NCID BA19787203. Bussmann, Rainer W. (2006). 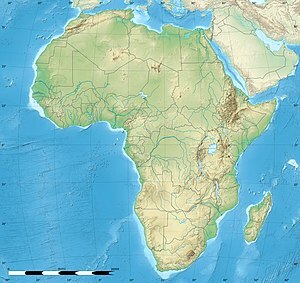 “Vegetation zonation and nomenclature of Africa Mountains - An overview”. Lyonia 11 (1): 41–66. https://www.researchgate.net/publication/267569096_Vegetation_zonation_and_nomenclature_of_African_Mountains_-_An_overview. Farjon, A. (2013a). Juniperus procera. The IUCN Red List of Threatened Species 2013: e.T33217A2835242. https://doi.org/10.2305/IUCN.UK.2013-1.RLTS.T33217A2835242.en. Downloaded on 08 July 2018. Farjon, A. (2013b). Podocarpus milanjianus. The IUCN Red List of Threatened Species 2013: e.T42520A2984512. https://doi.org/10.2305/IUCN.UK.2013-1.RLTS.T42520A2984512.en. Downloaded on 08 July 2018. Hassler, M. (2018). World Plants: Synonymic Checklists of the Vascular Plants of the World (version Apr 2018). In: Roskov Y., Abucay L., Orrell T., Nicolson D., Bailly N., Kirk P.M., Bourgoin T., DeWalt R.E., Decock W., De Wever A., Nieukerken E. van, Zarucchi J., Penev L., eds. (2018). Species 2000 & ITIS Catalogue of Life, 30th June 2018. Digital resource at http://www.catalogueoflife.org/col. Species 2000: Naturalis, Leiden, the Netherlands. ISSN 2405-8858. IUCN SSC East African Plants Red List Authority. (2013). Lovoa swynnertonii. The IUCN Red List of Threatened Species 2013: e.T33967A2839464. https://doi.org/10.2305/IUCN.UK.2013-2.RLTS.T33967A2839464.en. Downloaded on 08 July 2018. Kamau, Loice Njeri et al. (2016). "Ethnobotanical survey and threats to medicinal plants traditionally used for the management of human diseases in Nyeri County, Kenya". TANG 6(3). Luke, W.R.Q. (2010). Carex monostachya. The IUCN Red List of Threatened Species 2010: e.T185241A8373530. https://doi.org/10.2305/IUCN.UK.2010-3.RLTS.T185241A8373530.en. Downloaded on 08 July 2018. Magombo, Z.L.K., Mbeiza Mutekanga, N. & Ndiritu, G.G. (Freshwater Biodiversity Assessment workshop, Uganda. Dec' 2003)). (2004). Lobelia aberdarica. The IUCN Red List of Threatened Species 2004: e.T44715A10939927. https://doi.org/10.2305/IUCN.UK.2004.RLTS.T44715A10939927.en. Downloaded on 08 July 2018. Schmitt, Klaus (1991). “The vegetation of the Abedare National Park Kenya”. Hochgebirgsforschung 7: 1–250. https://books.google.co.jp/books?id=U2R-AAAAMAAJ&q=mucinjigiri+Gnidia&dq=mucinjigiri+Gnidia&hl=ja&sa=X&ved=0ahUKEwih7_Du7tTcAhXIwrwKHSmZB14Q6AEIJzAA. Williams, E. & Crook, V. (2016a). Dendrosenecio battiscombei. The IUCN Red List of Threatened Species 2016: e.T63923383A63934870. https://doi.org/10.2305/IUCN.UK.2016-3.RLTS.T63923383A63934870.en. Downloaded on 24 July 2018. Williams, E. & Crook, V. (2016b). Dendrosenecio keniensis. The IUCN Red List of Threatened Species 2016: e.T63923702A63934910. https://doi.org/10.2305/IUCN.UK.2016-3.RLTS.T63923702A63934910.en. Downloaded on 09 July 2018. Williams, E. & Crook, V. (2016c). Dendrosenecio keniodendron. The IUCN Red List of Threatened Species 2016: e.T63923748A63934915. https://doi.org/10.2305/IUCN.UK.2016-3.RLTS.T63923748A63934915.en. Downloaded on 09 July 2018. Williams, E. & Crook, V. (2016d). Helichrysum brownei. The IUCN Red List of Threatened Species 2016: e.T63924333A63934965. https://doi.org/10.2305/IUCN.UK.2016-3.RLTS.T63924333A63934965.en. Downloaded on 16 July 2018. Williams, E. & Crook, V. (2016e). Senecio keniophytum. The IUCN Red List of Threatened Species 2016: e.T63925076A63935005. https://doi.org/10.2305/IUCN.UK.2016-3.RLTS.T63925076A63935005.en. Downloaded on 11 July 2018. World Conservation Monitoring Centre. (1998a). Brachylaena huillensis. The IUCN Red List of Threatened Species 1998: e.T33474A9786563. https://doi.org/10.2305/IUCN.UK.1998.RLTS.T33474A9786563.en. Downloaded on 08 July 2018. World Conservation Monitoring Centre. (1998b). Vitex keniensis. The IUCN Red List of Threatened Species 1998: e.T33475A9786665. https://doi.org/10.2305/IUCN.UK.1998.RLTS.T33475A9786665.en. Downloaded on 18 August 2018. Knox, E.B. (2005). "Dendrosenecio." In: H.J. Beentje and S.A.Ghazanfar (eds. ), Flora of Tropical East Africa, Compositae, Part 3, pp. 548–563. Kew, London: Royal Botanic Gardens.